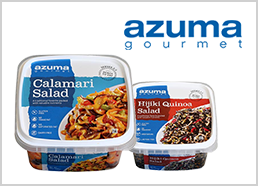 Results for "Seaweed Salad" | Azuma Foods International Inc., U.S.A. Mix diced Tuna with poke sauce. Place on a plate, top off with Seaweed Salad, garnish with another Tuna Poke. Place Wonton chips, topped with Seaweed Salad, imitation crab, and cilantro. Garnish with sliced lime. Tuna cube cut, Seaweed salad, top off with Yuzu flavored Tobikko. Deliver some Zesty Citrus scent to your everyday Poke Bowl. Mix diced Tuna with poke sauce. Place over rice and Seaweed Salad. Garnish with avocado and red onion. Sticky Rice, Tuna Cube, Seaweed Salad, and garnish with Tobikko. Taco shell with gives a new texture to Poke. Lay Buckwheat Soba on a plate with Seaweed Salad, avocado, grilled shrimp. Ask customer to drizzle noodle soup base before eating. Grill seabass with lemon, salt & pepper. Top off with Gomawakame for contrast and presentation. Grill skewered shrimp with olive oil, salt, and pepper. Use Gomawakame as base for presentation. Grill Salmon with butter, salt, and pepper. Use Gomawakame as base for presentation. Grill block of tuna with olive oil, salt & pepper. Use Gomawakame as base for presentation. Mix in lemon juice, olive oil, soy sauce, wasabi into Cube Cut Tuna. Top it off with Gomawakame that gives brilliant contrast. Place soft tortilla, topped with Seaweed Salad Delight and tofu. Garnish with tobikko for the color. Layer of mashed potato, Seaweed Salad, Lobster. Top off with Lobster Roe Paste to add delightful pleasure on your palette. Mix cube cut tuna with our Spicy Seaweed Salad, and lay over rice. Have some kick in your poke. Cube Cut Tuna with Spicy Seaweed Salad, top off with Tobikko Arare and Masago Habanero. Server on top of Tortilla. Place Tuna Cube, Seaweed Salad, and sprinkle some Tobikko Yuzu. Give some appearance to your Poke. Unagi Kabayaki with Cooked Egg, Tuna with Seaweed Salad, and a scoop of Tobikko for bright color. Unagi Kabayaki & Tobikko, Patty & Cooked Egg, and Calamari Salad with chopped veggies. Creativity is limitless. Sandwich Tuna Patty, Seaweed Salad, Reito Tamagoyaki in Bao Buns. Sprinkle on a Umami Toppers before serving. Lay Seaweed Salad, put the sliced scallop on top. Decorate with Black Tobikko, and sprinkle with Masago Arare for a great presentation. Give a crunchy hint to an ordinary Poke by adding Tobikko Arare. CubCube Cut Tuna with Spicy Seaweed Salad, top off with Tobikko Arare and Masago Habanero. Serve on top of Tortilla. Tuna Cube Cut with Seaweed Salad, top off with green onion and Tobikko Arare for the crunchy texture. Cube Cut Tuna with Spicy Seaweed Salad, top off with Tobikko Arare and Masago Habanero for appealing color. It is always a great idea to grill Ankimo. It is even called a Sea Foie Gras. Carve Tomato, fill it with Seaweed Salad. Decorate with thin cut daikon radish; top off with Angel Tears for a treasure box a like platter. Julienne daikon radish, mix cucumber, tomato, wakame, and Madako. Drizzle sesame dressing, garnish with radish sprouts and seaweed. Place purple cabbage, diced Tuna on a flour tortilla. Top it off with Seaweed Salad for flavor, and garnish with tobikko.